The sale to list price ratio is an indicator of the strength of the market. On April 14, 2009 the sale to list price ratio in Cambridge was 97%. The ratio has risen steadily over the past 5 years. On April 14, 2014 the ratio was 103%. This indicates that buyers are paying over list price because of multiple offer scenarios. The trend of an increasing sale to list price ratio is an indication that the market is in the midst of an appreciating cycle. An excess of demand over supply combined with ongoing low mortgage interest rates is driving continuing price appreciation. The sale to list price ratio was calculated by looking at the past 3 months of sales from April 14 in the years from 2009 to 2014. Property types are single family, condo, and multifamily. The sale to list price ratio in Somerville closely mirrors that of Cambridge. 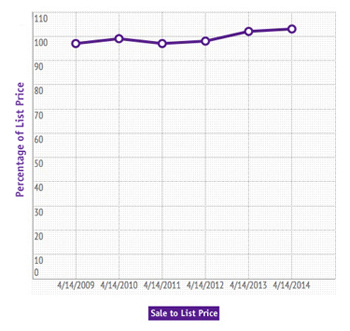 On April 14, 2009 the sale to list price ratio in Somerville was 97%. On April 14, 2014 the ratio was 103%. Somerville, like Cambridge is experiencing low inventory, high buyer demand, and appreciating values. The number of days that listings stay on the market indicate the rate at which inventory is being absorbed. 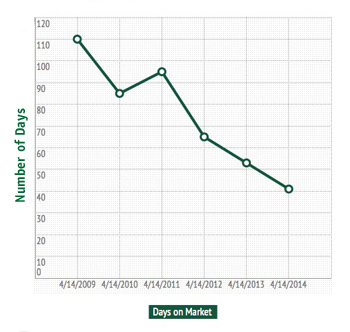 On April 14, 2009 the average day on market (DOM) in Cambridge was 110. Average DOM has trended down steadily for the past five years. On April 14, 2014 the average DOM was 41 days. This indicates that the market has been trending in favor of sellers over buyers. 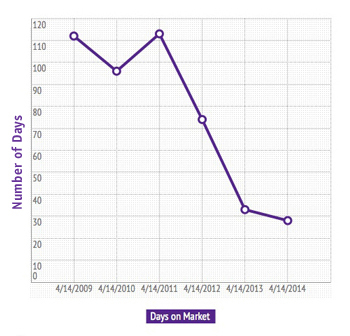 On April 14, 2009 the average day on market (DOM) in Somerville was 112. Like Cambridge, average DOM has trended down steadily for the past five years. On April 14, 2014 the average DOM was 28 days.